I’ve complained about my AppleTV for a long time and I thought it would be good to do an update. If you haven’t been playing along with our home game, it might be fun to do a review. Steve and I bought the original AppleTV ages ago, and I pretty much hated that thing. It didn’t do anything I wanted and even with the hacks available still we hated it. I hated it so much that I tweeted out that for $50 I’d send it to anyone I wanted. Jonathan Cost jumped on the deal and I shipped it off to him. When the AppleTV 2 came out, we gave it another try and it wasn’t at all bad. In fact, it was pretty cool to be able to rent movies and such with the device. Life was good. In fact so good that we bought a second AppleTV 2, and eventually bought an AppleTV 3. When Airplay came out, it became even more fun. Disappointed that Steve’s Macbook Air was just a couple months too old to have Airplay, but AirParrot works sort of ok, unless he wants audio with his Airplayed content of course. Every Friday night we rented movies via AppleTV … until one night when it didn’t work. We rented a movie but when we tapped on Play, it said that it would take 6 hours and 12 minutes to play the movie. I went online and found that people had run into this problem and solved it by logging out and (laboriously) logging back in and going to check for rentals and then the movie would play. We tried it and sure enough, it worked! Yay. Problem solved. Steve and I are engineers, and believe in scientific experiments, using control groups and all that, so testing the Roku side by each on the same network was a significant datapoint. We believed we’d eliminated the network from the equation, but what if the AppleTV itself had a problem. 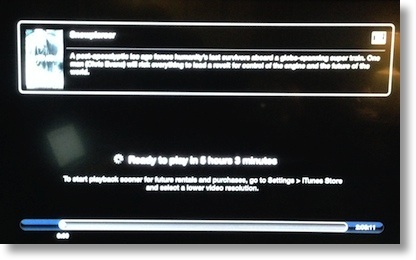 We swapped in one of our AppleTV 2’s from another room … and had the same long delay before starting a movie. So we’ve eliminated the network and the device. Week after week, ever hopeful, we’d rent a movie on iTunes, be unable to watch it, and then go over to the Roku and rent it from Amazon and watch our movie. Then while we watched the movie, I’d go over to Apple and complain and they’d give me a refund. After three weeks in a row, they even gave me three free rentals … on a service that won’t let me play the movies I rent. Thanks. That pretty much brings you up to date to this week. We do turn the AppleTV on for other things, like HBO Go, and we happened to tap on Movies. We noticed that the little movie posters weren’t rendering. That got me thinking maybe something was wrong with the AppleTV after all. We decided it was time to do a full reset of the AppleTV. Should have thought of that a long time ago, right? After the reset, I had to use that horrible AppleTV remote to type in the WiFi password, my AppleID, and my AppleID password. So 12 hours later I was ready to try again. We crossed our fingers and felt really optimistic about the whole effort. Back into Movies, we rented Snowpiercer, a post-apocalyptic movie about the last survivors on earth all trapped on a train traveling around the world. Pretty good movie by the way. We were so excited because we were CERTAIN that we’d be able to watch the movie. And up came the message, “Ready to play in 5 hours and 3 minutes”. Seriously. My favorite part is how they suggest that it’s YOUR problem and if you lower your expectations and set your AppleTV to Standard Def maybe your poor weak little Internet connection will be able to keep up. Yeah, I’ll pay for an HD movie and then play SD. Noticed the Amazon Affiliates Link. Sounds like this person wants to downgrade the Apple TV to justify why Amazon doesn’t carry it. I have model 2 and 4 with no such problems. Amazon is pushing their Fire Stick and is keeping their app from Apple TV because they can’t stand competition. I have Amazon Prime, but may discontinue it later this year when the subscription is up for renewal. I do not understand why they don’t want to put their service on Apple TV. I also like that Apple included Voice Over for visually impaired individuals.